Designed to maneuver open pallets or skids to punch and printing presses, conveyors, etc. 3,000-lb. capacity truck features 7"W forks with 8" dia. polyurethane load wheels and 3" dia. polyurethane load rollers. Narrow 180° steering arc is ideal for compact areas. Other features include: solid steel bar scissors and loop handle with inside hand control. Will not work with closed pallets unless pallet is set on top of forks. 27" x 48" FORKS ARE FACTORY QUICK SHIP. All FOB WISCONSIN. 12V DC battery-powered lift raises loads in as little as 9 seconds. Includes battery, charger, and release valve. Use anywhere lifting is requiredwarehouses, factories, assembly lines or tool rooms. Ergonomic design reduces chance of injury while increasing productivity. Choose between manual models with foot pump or electric models that have 12V DC battery. Electric units also feature an on-board power unit with a battery and external automatic charger that runs on 110V input. All models have 3-1/4"32-3/4" fork height and 2,200-lb. capacity. FACTORY QUICK SHIPFOB WISCONSIN. WP-1513A 20-1/2" x 48"	 20-1/2 x 48"	 546	 431-1/2"
WP-1513B 27" x 48"	 27 x 48"	 546	 431-1/2"
XL-0497 Wt. 15 lbs. Removable Platform for 45-1/2 x 20-3/4" Lifter. XL-0498 Wt. 18 lbs. Removable Platform for 45-1/2 x 27-1/2" Lifter. XL-0499 Wt. 2 lbs. 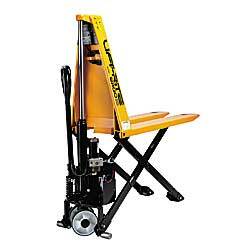 On-Board Charger for Electric Skid Lifters.